Fuerteventura is considered the ideal destination for windsurfers thanks to the constant trade winds. 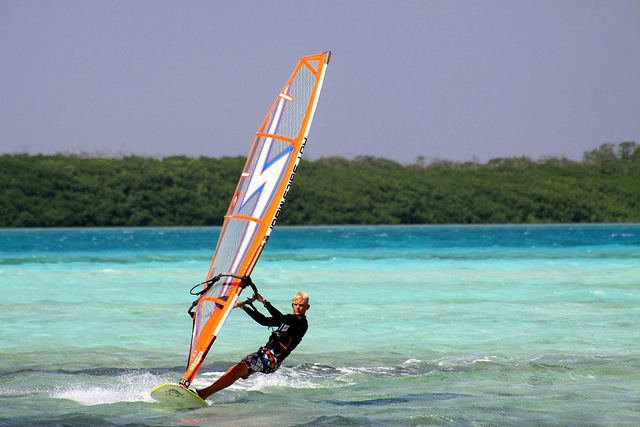 The island’s pleasant temperatures and crystal clear waters make Fuerte a paradise for water sports. The coast offers many places to windsurf, including the calm lagoons of Cotillo, a Flag Beach, and various spots along the dunes and close to the town of Corralejo. Qualified instructors will teach you to use the windsurf independently and in the advanced course you will assimilate the practical and theoretical knowledge, focusing on the conduct of the board with the movement of the wind, and then on to the first basic manoeuvres of tacking and gybing. Fuerteventura is undoubtedly the ideal place to start windsurfing. TEST YOURSELF! DISCOVER YOUR LIMITS AND THE MYSTERIOUS FORCE OF THE SEA!